Hardboard is available in a variety of types - Standard, Painted, Oil Tempered or Perforated. 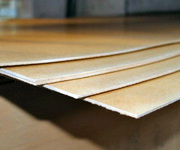 We supply Hardboard sheets in a variety of types and sizes to match your requirements. Hardboard is commonly used are for picture frame backs, floor covering over floorboards to cover slight unevenness or gaps. This is a good use as it gives a smooth finish for the subsequent carpet or vinyl covering and also helps to reduce or eliminate draughts. Hardboard is available in Standard form, Painted or Oil Tempered that gives a high degree of resistance to moisture. It is advisable NOT to use Oil Tempered under a light or pale coloured Vinyl Floor due to a possibility of the Dark Brown natural colour being absorbed through the Vinyl causing discolouration. It is recommended that Standard Hardboard be conditioned before use by wetting the back (Rough side) with clean water. This increases the moisture content of the sheet and when allowed to dry out in the building where it is to be installed the moisture content will adjust to the same level prevailing. This will ensure the boards lie flat with no unsightly bumps between the stapled or nail fixings that should be applied at approx 150mm centres all over. Some versions of hardboard are pre drilled creating perforated or pegboard sheets. A selection of clips may be purchased to fit these holes for use as attachment points to hang tools in workshops or stock items in shop and stores. Avon Plywood stock various sizes of Standard, Oil Tempered and Perforated Hardboard .